Nothing else than a restyled TI-3000 with an additional sliding switch to select between Chain and Constant mode. We already know this wooden foil from the Exactra 22 or the Western Auto M4986. 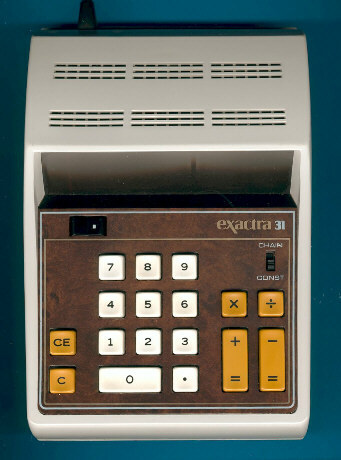 From the technical point of view the Exactra 31 uses the calculator chip borrowed from the TI-3500 on a printed circuit board found in the TI-3000. Don't miss the rare TI-3510. Fellow collector Michel Zwawiak reported recently a different design of the Exactra 31 sporting white keys with the serial number 3100 007108. Unfortunately is the production date label missing. Gilles Collas just reported with 3100 007195 a second "white key" Exactra 31.